Picture it, last Thursday, while leisurely sitting at my computer I received an email from Norstrom featuring this oh-so swoonworthy Longchamp bag and all I could thinkof was a potential wedding theme. It's true, inspiration is everywhere! I call it... Moody Romance. So, what do you think? We'd love to know where you have you found wedding inspiration in the most unexpected of places? It's safe to say weddings have come a long way from the 70s. I think all of us at one time or another have poured over the wedding albums of the past and chuckled at the wood paneled reception halls, bell bottomed suits or tuxes and Jordan almond colored bridesmaid dresses. Heh, I think I just summed up my parent's 1975 garden wedding in one sentence. However, one hot trend we are seeing is the resurrection of the 70s style home video, also known as Super 8. Per Wikipedia, Supr 8 mm film, also simply called Super 8, is a motion picture film format that was developed in the 1960s and released on the market in 1965 by Eastman Kodak as an improvement of the older 8 mm home movie format, and the Cine 8 Format. These days, although most usage of Super 8 has been replaced by more updated film formats, certain cinematographers are choosing to inject Super 8 clips into their otherwise traditional format wedding videos, or have opted to completely replace the traditional kind altogether; with the philosophy that the Super 8 video is a superior expression of art. If you are longing for a retro/romantic home wedding video (but not really), one that will remind you of the opening credits to Wonder Years, this could be the style of video of for you. Appreciating all things vintage, I think it's pretty cool. 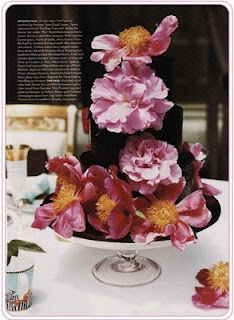 I've never seen this much flower on a wedding cake before and I think it is the cutest ever. Perfect for an outdoor wedding, or even an individual table centerpiece. This time three years ago, I was just about to put on my wedding gown. Two hours later, I wed the love of my life. Four hours after that, hurricane Ophelia flooded my tent and I decided I felt ok about skipping the draping :). Another four hours later, our guests decided it didn't matter and we had a great dance party in the puddles to Dave Matthews Band. It was beyond awesome in every way. When I first met with Eileen and Nate last November, I was immediately drawn to their pure adoration for one another, great sense of style and mutual vision for their wedding. Just listening Nate recount the story of how he proposed to Eileen with twinkles in his eyes (hint, it included a much pined after Louis Vuitton as a decoy - does it get any better?? ), made me fall in love with them as couple even more. Over the course of the past year Eileen, her mother Ella and I kept in touch about buying her dress at Kleinfields, the perfect flowers, mood enhancing lighting and party starting band. As Manhattanites, they were going for an Old New York ballroom feel meets the ambiance reminscent of a European bar; Sinatra without the Sinatra. We mapped out every last detail of her wedding to ensure all facets were attended to and the day with multiple locations and a huge bridal party would flow seamlessly. All our hard work paid off as the day was *unbelievable* from start to finish. So I present to you, Eileen and Nathan. Unless otherwise disclosed, all photos taken by the exceptionally talented, highly personable and newly married Richard Esposito! On Sunday, August 31, Eileen and Nate began prepping for their day at the Goodwin Hotel in Hartford. While Nate and the guys enjoyed a leisurely morning, Eileen and her maids were busy with hair and make-up from Erin, Angela and Liz of Naomi's Make-up Studio and Salon. They were all in high spirits when I checked in on them too. After trying on what was estimated to be 50 dresses by her ladies in waiting, Eileen chose a swoonworthy Pnina Tornai gown, which is a line exlusively designed for Kleinfelds. We all took turns admiring it! A gal after my own heart, she had not one, not two, but THREE pairs of awesome wedding shoes. The Badgleys, were my personal favorite! Check out these yummies! The dress, which had both an internal corset and a long line of external buttons, fit Eileen like a glove. Hair half up and a ribbon edged veil finished her look. Le sigh. After everyone was dressed, off we went to the rose garden at Elizabeth Park where Talia was waiting for Eileen and Nate's first sighting and bridal party photos. The girls wore Amsale frocks of the palest pink. The guys donned their own tuxes from various designers. Nate's, in particular, was from Barney's. After photos, the bridal party and family arrived at the Wadsworth Atheneum in Hartford for the ceremony, beginning with signing of the ketubah in in Loctite Lobby. During this time, guests were greeted in Morgan Main Lobby with wine service by Jordan Caterers and classical music by Kathy and her string ensemble from Millennium. They played for the ceremony and cocktial hour as well. The Jewish ceremony took place at 6:00 p.m. in Morgan Main. I am over the moon for art galleries for ceremonies; truly nothing compares. Following the breaking of the glass and a kiss, the ceremony ended and cocktail hour began in Avery Court. Here's a photo taken by me of the couple as soon as they processed out. How's this for newlywed bliss? Cocktail hour in Avery Court under full swing. I got to try a chocolate milk shake shooter and it was faaaantastic. Upon the end of cocktail hour, all guests were transported via Dattco to the Bond Ballroom (also in Hartford) for the reception. The entire day's composition of gothic lobby entrance, art gallery ceremony, stark lobby for cocktails and restored ballroom reception made a seriously captivating contrast of old and new. L.O.V.E. At the Bond, guests were greeted by soft amber lighting provided by Dan of Shindig Lighting. Dan did an amazing job of transforming the room to the old New York feel Eileen dreamed of through uplighting, monogram gobo, ceiling wash and strategic pin spotting. Tables were decorated with various tall branchy centerpieces featuring hanging votives. Jessica lived up to her superb reputation as they were spec-tac-u-lar. Following dinner, guests were treated to more appetizers and live music by New York Dream Band of Jerry Kravat Entertainment. They did a great job of keeping the dance floor packed all night (and early morning!) long. Some additional detail shots taken by us, including Lance Armstrong favors and the cake, which featured an initial topper. Eileen & Nate, I am a bit sad as I conclude this post as I felt like we were old family friends by the end of your wedding. I hope you enjoyed a wonderful and relaxing honeymoon in Hawaii before returning to the city. Eileen, I wish you the best of luck as you begin your second year in medical school and Nate as you start your career in the legal world. I can only imagine the wonderful life ahead that awaits you. This weekend my husband, Ed, and I had the pleasure of attending a wedding as guests! Something I rarely do now, but definitely enjoy! Our dear friends Dana and Matt were married on Saturday. I have known both of them since childhood; it is always so fun when people who have essentially grown up together, get married, as you run into so many people with whom you have not seen in some time but are so happy to catch up with. Congratulations Dana and Matt! I wish you both years of happiness, health and prosperity ahead! Thank you so much for having us! We had a wonderful time. 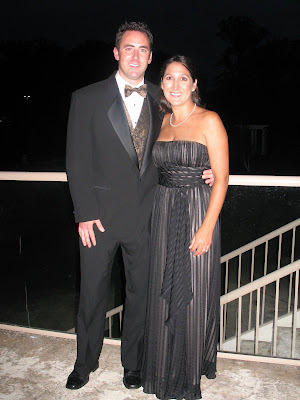 When close friend (and fellow SPFYS assistant) Alicia told me her sister Jessica was planning a wedding in the states exactly two years from the date she was married in Italy (August 24, 2006), I immediately offered my assistance. Jessica and Davide have the type of story in which ballads are written and movies are made; truly one demonstrating that love has the ability to move mountains and that fairy tales do come true. You can read about it here in Steve DePino's blog, as they were the recipients of his free wedding package. After having a small civil wedding and reception in Italy hosted by Davide's family with only her mother and her sister present, it was important for Jessica to also have a traditional American wedding with all her friends and family here. After touring nearly every single venue in the state, she and Davide selected the Gelston House in East Haddam for their reception. The venue has an unblievable sense of history and location and I honestly could not even think of a better match for the two of them. Jessica and I worked together over the past eight months or so to ensure her timing was perfect and that her details were unique and interesting for all of their friends and Davide's family that traveled from Italy. I have to give Jessica a lot of credit as the week of her wedding she and her family hosted 13 members of Davide's family! Then I met up with Jessica, Alicia, their mother and their darling cousin Madison, who were prepping at Gelston House by the fabulous Dana Bartone. The ceremony had readings in both English and Italian and was beautiful. You can see the emotion Steve DePino caught here on Jessica's face. Jessica donned a Casablanca gown purchased at Brides To Be in Glastonbury. The portrait neckline framed her shoulders beautifully. Davide wore an incredible custom suit from Italy that he wore for their first wedding. The best part of his outfit were the little Italian flags on the bottom of his shoes! After the ceremony, the newlyweds departed in this fabulous Mercedes coup. Jane made the fun bow. Following the ceremony, guests traveled to Gelston house where they were greeted by numerous personal touches. Jessica and Davide worked hard on all their little details, which included tables named after all the places they have traveled together, CD favors with favorite US and Italian music as well as the traditional Jordan Almonds - YUM! For their cake they used up and coming pastry chef Matthew Seguro of Newington. It was truly one of the best cakes I have ever tasted. Joe Mick of A.E.P Disk Jockey Professionals did a great job of keeping the dance floor packed with all ages with both American and Italian music. Kate and Rich of Star Quality Video filmed the event and were so nice to work with as well. The evening was further personalized with speeches in both Italian and English, as well as a video of Jessica and Davide's first wedding in Italy and a through the years photo montage. Jessica and Davide, it was an honor to witness your day here and meet Davide's family from Italy. I need not wish you happiness as I know you have it! I'm a girl with a mission . .When I was planning my own wedding it was for the perfect earrings and hair feather. When we moved into our first home it was for the perfect coffee table (found!) and antique bombe chest (still looking). Most recently, I've been on a quest to find a client the perfect venue for her small winter wedding. Like most of my missions, the hidden treasure at the end of the rainbow almost always shows its pretty face when I am least looking, or just happen to stumble upon it in such an unpredictable manner I might have missed it altogether had I just gone about my regular day. Be still my heart is right. The venue is none other than the Silas W. Robbins House Bed and Breakfast, which has an amazing sense of history and an even more amazing restoration story. Innkeepers John and Shireen Aforismo and and their adorable grandaughter Hannah, for whom the third floor ballroom is named after, were kind enough to give me a tour and provide me with all the information I needed. Walking inside, you are immediately welcomed into a stunning foyer with fabulous antiques and period details. Shireen did a magnificent job decorating every inch of this property. On the first floor there is a lovely sitting parlor, breakfast room and dining room. On the third floor of the house is a cream-puff of a ballroom, so sweet I could eat it up! It's just perfect for a small wedding of 40 people or so, a bridal shower or any other ladies luncheon. Need something a little bigger for your event? Check out this lawn, so fabulous (and flat!) for a tented wedding of 120 or so. They have also held ceremonies on the front stairs of the property. Rental fees begin at $525 for 3 hours and include basic tables and chairs. If you rent the facility,you are required to book the five guest rooms; prices range from $195-$325 (excluding 12% tax and gratuity). This price includes breakfast the following morning as well. Even if you are getting married at a different location, the Silas W. Robbins House is a spectacular place in which to get ready and/or spending your wedding night. Check out the bridal suite! and . . the penny tiled bathroom with multiple shower heads! Finally, this stunning suite I am personally over the moon for. Can I move in please?? I am so in love with this place I can't stand it. I hope my client adores it as much as I do!